December 19th. That is an important day to remember for anyone sending Christmas gifts. That is the last day that the postal service will guarantee that the person you’re sending to will get the gift by Christmas. If you think the lines at the post office are bad now, then just try to send something on that day. Hopefully, you’ll get everything shipped long before that cut off. It helps to do some pre-planning around the holiday season. That also includes getting your house in order. 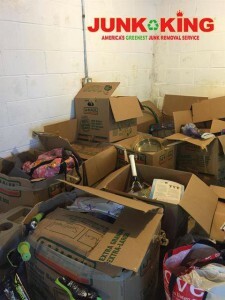 Now is the perfect time to schedule your junk removal session with Junk King Philadelphia to get your home totally junk free for the holidays. Getting rid of junk might have been a task you’ve been putting off for some time. If you missed clearing clutter during your spring break cleaning, then perhaps you wanted to wait until summer. Of course, who wants to take on that kind of job in the summer? The thing to remember about hiring Junk King is that you won’t actually be doing any work. You also won’t be sacrificing a lot of time either. Junk King will send a crew over to your home to do all the heavy lifting. That includes climbing stairs. All they ask is that you set aside a two-hour window for the appointment. Most removal sessions only take a fraction of that two-hour. That “window” is put in place to give the crews time to get from one appointment to the next. Much better than the five-hour window the phone company asks for! The moment the crew arrives, they want to get busy. That starts with them looking over all the things you want to get rid of. They don’t have to be in a single pile. They know how to size things up. This is how they’ll determine the price. It is going to be based on how much room your stuff is going to fill on the back of the truck. One rate covers everything from the pick up to the drop off. Get your holidays off to a junk free start with a Junk King Philadelphia session today. This entry was posted in Philadelphia Junk Removal and tagged clutter, holidays, junk, Junk King on November 2, 2017 by Junk King. Last updated November 2, 2017 .